Japanese brands continue to dominate Consumer Reports survey taking the top nine spots, led by Scion, Lexus, Acura, Mazda, Honda, and Toyota. Of the 91 Japanese models for which Consumer Reports has sufficient data, 87 vehicles or 96 percent were rated average or better in predicted reliability. 24 Japanese models earned the highest rating. The biggest improvement was from Mazda, which moved up eight spots from last year. All its models were rated above average. Scion remains the top brand in Consumer Reports survey, but only two models of its three, the xB and xD, had sufficient data to be included. Lexus, with 11 models included, rebounded seven places from last year. Toyota finished sixth overall, the same as last year, and every Toyota model except the all-wheel-drive version of the Sienna minivan was average or better. Many hybrids are proving extremely reliable. The top two models in our survey are the Lexus CT 200h and Honda CR-Z. The Toyota Prius was among the top models, rebounding from brake problems that plagued the current design. Honda also had just one below-average vehicle, the redesigned Odyssey minivan. The South Korean brands rank 11th and 12th in Consumer Reports' survey. Hyundai had just one below-par entry, the V6 Santa Fe. The V6 version of its corporate cousin, the Kia Sorento, also finished below average. Even with Chrysler's improvement, Detroit models still have reliability problems. Of the 97 domestic models and versions for which Consumer Reports has sufficient data, 62 or 64 percent rated average or better in Consumer Reports's new-car reliability ratings. Chrysler had better results with its new models, including the freshened Chrysler 200 (formerly Sebring) sedan and the redesigned Dodge Durango and Jeep Grand Cherokee SUVs. Chrysler's Jeep brand moved up seven spots to 13, becoming the most reliable domestic brand, and all its models for which Consumer Reports has sufficient data scored average in predicted reliability. The Chrysler brand moved up 12 but its rank is based on just two models: the 200, which was well above average, and the freshened Town & Country minivan, which tanked. and the Dodge brand gained three spots in the rankings. The remaining model, the 300, is too new for Consumer Reports to have sufficient data. General Motors stumbled after edging up last year with Buick and Cadillac brands, in particular, taking a step backward while Chevrolet held steady and GMC dropped one spot. The new Buick Regal and Chevrolet Cruze were below par in reliability. The Buick LaCrosse, an all-wheel-drive version of the Buick Enclave, and the Cadillac SRX were all deemed reliable last year but dropped to below average and are no longer recommended. General Motors' bright spots include the above-average Chevrolet Avalanche and the Cadillac CTS, which has improved to average. The gas/electric Chevrolet Volt, with much better than average predicted reliability, ranks as GM's most reliable car but with a caveat: The sample size was just a little more than Consumer Reports' minimum threshold of 100 cars, and most respondents had owned theirs for only a few months. The new Ford Explorer, Fiesta, and Focus all had below-average reliability in their first year, according to Consumer Reports pushing Ford's rank to 20th out of 28 car makes, down from it's 10th ranking last year, the biggest drop for any major nameplate in Consumer Reports 2011 Annual Auto Survey. Ford's drop can also be attributed to problems with the new MyFord Touch infotainment system and the new automated-manual transmission used in the Fiesta and Focus. Lincoln finished above Ford, although the freshened MKX, a cousin of the Edge, suffered from the MyLincoln Touch system. Heavy-duty, three-quarter-ton pickups are among the most problematic vehicles, with the exception of the turbo-diesel Ford F-250, they all scored below average. On the bright side, the Ford Fusion Hybrid sedan remained outstanding, and other Fusion versions were above average. Overall, European vehicles' reliability is slightly below that of domestic models. Of the 58 European models for which Consumer Reports has sufficient data, 37 vehicles or 64 percent scored average or better in predicted reliability. Volvo ranked the highest at 10th overall, helped by the redesigned S60, which was above average in its first year. Volkswagen was able to hold on to 16th place in the ranking with seven of its 11 models scored average or better. Mercedes-Benz and BMW improved, but results were inconsistent for their various models. BMW's redesigned X3 SUV did well, for example, but the redesigned 5 Series sedan was well below average. Mercedes' compact GLK SUV improved, but its flagship S-Class luxury sedan fell to below average. Jaguar, Porsche, and Audi are at the bottom among brands for which Consumer Reports has sufficient data. Porsche dropped from being the second-best brand last year to the second-worst. That big shift occurred because Consumer Reports has data for only two models, one of which, the redesigned Cayenne SUV, had a terrible debut year. Jaguar trails the pack as its XF and the new XJ were the two least reliable new cars in the survey. Findings are based on responses on 1.3 million vehicles owned or leased by subscribers to Consumer Reports or its Website, www.ConsumerReports.org. The survey was conducted in the spring of 2011 by Consumer Reports' National Survey Research Center and covered model years 2002 to 2011. The above article was taken information provided to the public by Consumer Reports. For more detailed information subscribe to Consumer Reports. The all-new 2012 Range Rover Evoque has been named 2012 Sport/Utility of the Year by Motor Trend. Candidates for the award are then evaluated under six criteria – advancement in design, engineering excellence, efficiency, safety, value, and performance of intended function – to determine the one model that performs best for its intended purpose and to Motor Trend's highest standards. "The Range Rover Evoque is a bold move into the fast-growing compact luxury SUV sector," said Angus MacKenzie, Editor-in-Chief, Motor Trend. "Refined and capable both on and off the road, it artfully combines traditional Range Rover values with stunning state-of-the-moment design and impressive efficiency. The Evoque is a worthy winner of our award, and I have no doubt it will be a worldwide hit for Land Rover." The all-wheel-drive Range Rover Evoque has a 240-horsepower, turbocharged, direct fuel injected, four-cylinder engine coupled to a six-speed automatic transmission and will be available in two versions: a coupe and a five-door, with starting prices of $44,995 and $43,995, respectively for the Prestige Premium editions. The sixth generation BMW 3 Series Sedan has grown in size compared to its predecessor measuring 1.46 inches wider in the front and 1.85 inches wider in the rear and 3.66 inches longer overall sitting on a 2 inch longer wheelbase of 110.6 inches. The BMW 3 Series has three trim levels or an M Sport Package: the Sport Line, Luxury Line and Modern Line and two engine choices which both feature new BMW TwinPower Turbo technology: a 300 horsepower 3.0 liter 6-cylinder engine powering the 335i or the new turbocharged 240 horsepower 2.0 liter 4-cylinder engine in the BMW 328i. Both mated to either the standard 6-speed manual transmission or 8-speed automatic transmission which includes the new Auto Start-Stop function. The driver can choose Comfort, Sport, Sport + and ECO PRO modes to maximize fuel economy through their driving style. Other available features include: the latest-generation full-color Head-Up Display, Surround View with Side View and Top View, Parking Assistant to help the driver to parallel park, an Active Blind Spot Detection System and Lane Departure Warning System with camera-based Collision Warning system. The sports sedan is equipped as standard with front and side airbags for the driver and front passenger, plus head airbags for both rows of seats. 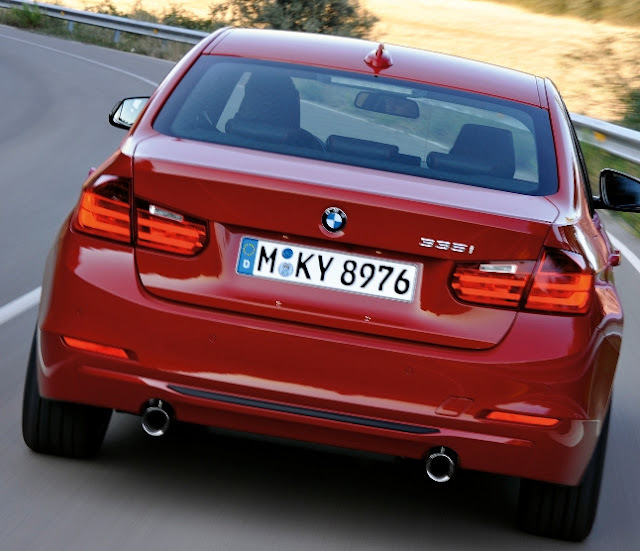 The sixth generation BMW 3 Series rear-wheel-drive sedan arrives in US showrooms in February 2012 as a 2012 model. 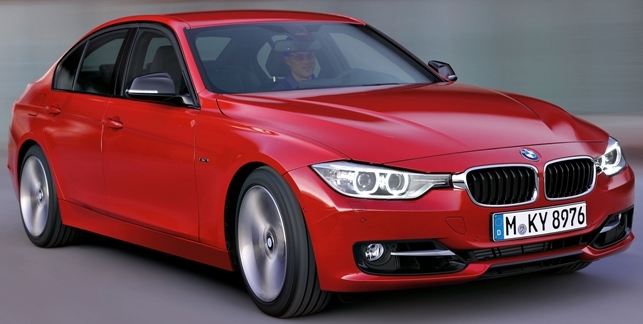 The BMW 335i xDrive and BMW 328i xDrive, all-wheel-drive models will go on sale in summer 2012. In the Fall of 2012, the BMW 3 Series ActiveHybrid 3 joins the fleet with the combination of the 300 horsepower inline 6-cylinder engine with BMW TwinPower Turbo technology and a hybrid-specific eight-speed automatic transmission with integrated electric motor which for limited periods can increase power by up to 55 horsepower. Maximum combined output is 335 horsepower. The all-new 2012 Volkswagen Beetle arrived for 276 lucky fans of “The Oprah Winfrey Show,” who learned they were receiving cars on November 22, 2010 during one of the show’s two “Ultimate Favorite Things” giveaways last year. They take home the all-new 2.5L 6-speed automatic Beetle in Denim Blue, Reflex Silver Metallic, Saturn Yellow or Tornado Red. Redesigned for the second time in history, the all-new Beetle is lower, wider and longer with optional Bluetooth® technology, iPod® connectivity and the Fender® Premium Audio System. 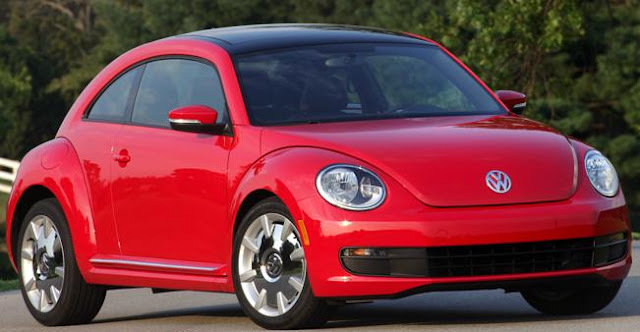 The 2012 Beetle vehicles are available now with the 2.5L five cylinder engine, which has a starting MSRP of $18,995, and the 2.0L TSI® Turbo engine with a starting MSRP of $23,395. The 2012 Volkswagen Beetle also went on sale today. Bijan Pakzad died of a stroke at age 67 in April of this year but the fashion icon's legacy for expensive fine automobiles to lure customers into his posh Bijan store on Rodeo Drive in Beverly Hills lives on. Bijan's collaboration with Rolls-Royce started 11 months ago before his untimely death and at that November 2010 announcement, Bijan said that 30 globally powerful customers will be receiving a Rolls-Royce with varying Bijan-influenced design and color fashion statements. 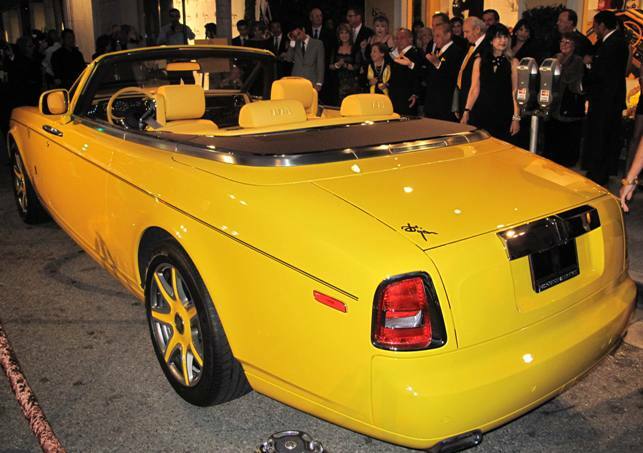 Last Thursday night's gala at Bijan's famed location that ignited Rodeo Drive's high fashion fame in 1976, was as much a tribute to the man as it was celebration of the unveiling of the first Limited Bijan Edition Rolls-Royce Phantom Drophead Coupe for a customer with the initials MMB. 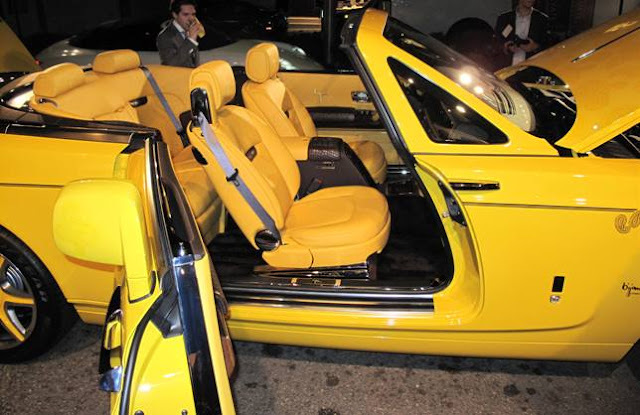 According to Rolls-Royce North America President David Archibald, there are 31 elements in this all-yellow edition that were requested by Bijan as part of the British automakers "Bespoke" program to personalize these fine cars. A typical Rolls-Royce Phantom starts at $450,000 so one would expect this line of customized ones to cost much more. Archibald said that this is the second one to be delivered to Bijan, with another in production and two others on order. Rolls-Royce sold over 2,700 cars in 2010 through its 85 dealers globally and sold more than 800 in the U.S. last year from its 32 dealerships. Though not disclosed, those numbers are expected to be exceeded in 2011. Rolls-Royce has two vehicle lines, the Phantom and the Ghost, that each have variations such as a long wheelbase version or as is the case with this Phantom, a 2-door coupe. Like all Rolls-Royces, this Bijan edition was built at the Goodwood factory in England and is powered by a 453 horsepower 6.75 liter V12 engine developed at BMW's Munich engine plant. The festivities around this introduction, like the car itself, were first class with gorgeous models serving food delicacies and champagne. Put Bijan on Rodeo Drive on your "must see" list when in Beverly Hills. Mark Reuss, President of General Motors North America Comes to L.A.
Mark Reuss, President of General Motors North America, is spending a few days in the Los Angeles area discussing how GM’s post-bankruptcy mindset has changed and how the company will revitalize their California dealers to improve the customer experience. Reuss spoke to a group journalists at a breakfast meeting and covered everything from marketing to products. He began by bragging about his recent 170 mile per hour experience behind the wheel of a Camaro LZ1 at Germany’s famed Nurburgring racetrack where the car recorded a sub-eight minute lap. The new Chevrolet Camaro LZ1 and sub-compact Spark will be shown at the Los Angeles Auto Show in mid-November. Reuss says that Chevy is becoming the brand that has everything and is the only top 5 global brand to have seen growth this year, with much of that due to sales of the Cruze over the past five months. For the balance of 2011, Reuss said watch for the Cruze ECO delivering 42 mpg, the 40 mpg Sonic which just starting selling last month and the Malibu ECO coming in December. In addition to the Spark mini-car hitting dealers in 2012, there will be all-new Impala giving Chevy an entry in all five car segments. 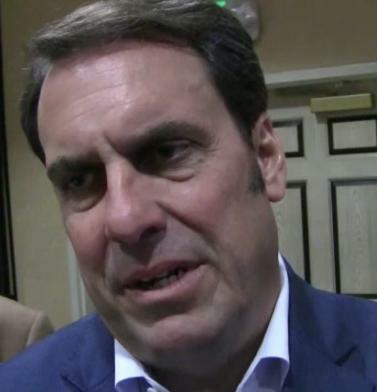 He also hinted that an all-new Corvette is coming and to stayed tuned for new truck announcements. On the demographic front, Reuss says the Millennials, the under 30 age group, will make up 40 percent of the car market next year and to help capture that buyer is working with a buddy of his at MTV to understand that crowd. Reuss mentioned that Buick has the Verano coming and Cadillac the XTS and ATS. He expects the Cadillac ELR, which was the Converj concept car, to have the same showroom draw as the Volt does for Chevy, saying that most people can’t afford the Volt so buy a Cruze. He says Cadillac will soon announce CUE, the Cadillac User Experience infotainment electronics package. There is a big push at General Motors to revitalize the West Coast dealer facilities, then it’ll be on to the “next coast”. Reuss believes that they have the “right products to begin to take back market share. California dreaming is becoming a reality.” In the next two days, he is making the rounds to dealers, media outlets and even the Los Angeles Chamber of Commerce to spread the GM word. On powertrains, Reuss says the E-assist improves fuel economy by 25 percent and with regards to GM bringing diesel to the U.S., he says the “turbo-diesel Cruze is the best version” and they're working on bringing it here. GM's RelayRides project announced today will be a car sharing service using private vehicles to be launched in California, but Reuss was not sure how all the logistics will work. Today's breakfast speech by Reuss was a very informative, frank and honest insight into General Motors, a company that us taxpayers have an equity interest in seeing succeed. On a personal note, Reuss told me privately that his 76 year old father, Lloyd, a former General Motors president, who I interviewed 20 years ago, had a bad spill last January so we wish him a speedy and full recovery. Labels: Mark Reuss, President of General Motors North America Comes to L.A.
General Motors reported total sales of 207,145 vehicles in September, a 20 percent increase compared with September 2010. Year-to-date GM sales are 1,353,943, an increase of 15.2 percent over 2010. Ford’s September sales totaled 175,199, up 9 percent versus last year. Year-to-date Ford sales are 1,603,998, up 11.4 percent from last year. Chrysler Group LLC reported U.S. sales of 127,334, a 27 percent increase compared with sales in September 2010 making it the best September sales since 2007. Year-to-date Chrysler has sold 1,009,411 vehicles, a gain of 23 percent over 2010. Toyota Motor Sales, U.S.A. reported September sales of 121,451, down 17.5 percent over the year-ago month. Through the third quarter, TMS reported sales of 1,194,524 vehicles, a decrease of 9.3 percent compared to the same period in 2010. Nissan North America reported September U.S. sales of 92,964, an increase of 25.3 percent. Year-to-date sales for Nissan and Infiniti is 513,809, a 14.9 percent rise over 2010. American Honda posted September sales of 89,532 vehicles, a decrease of 8.0 percent. American Honda year-to-date sales reached 859,797, down 6.2 percent versus last year. Hyundai Motor America announced sales of 52,051 vehicles in September, a 12 percent total sales increase compared with the same period a year ago. Year-to-date sales are 367,405, up 37.1 percent. Kia Motors America announced best-ever September sales of 35,609 units, a 18.4 percent increase over the same period last year. Year-to-date sales are 367,405, up 37.1 percent. Volkswagen of America reported sales of 27,036 in September 2011, a 35.6 percent increase over prior year sales. Year-to-date sales are 235,459. up 22.2 percent. Separately, Audi of America reported record September U.S. sales of 9,725 vehicles, topping the previous record of 2010. Audi U.S. year-to-date sales date grew 15.5 percent to 84,981. The BMW Group in the U.S. (BMW and MINI combined) reported September sales of 25,749 vehicles, an increase of 11.4 percent versus the same month a year ago. Year-to-date, BMW Group sales are up 14.2 percent to 219,314 in the first nine months of 2011 compared to the same period in 2010. Mazda North American Operations reported September, 2011 sales of 25,521 vehicles, up 37.4 percent versus September, 2010. Through the end of September, 2011 year-to-date sales are up 9.5 percent versus last year with 191,315 vehicles sold. Mercedes-Benz USA reported September sales of 23,897 vehicles, a 15.6 percent improvement over September 2010 and the company's highest September volume on record. On a year-to-date basis, the 182,314 vehicles sold represent a 10.3 percent increase over the same period last year. Subaru of America announced September 2011 sales of 20,934, a drop of 2.3 percent and sales of 195,550 year-to-date, a one percent rise over 2010. Mitsubishi Motors North America September 2011 sales of 5,803, a 17 percent increase over the September 2010 sales figures. Porsche Cars North America announced September 2011 sales of 2,170 vehicles, an increase of 10 percent compared to the same period last year. To date in 2011, Porsche has sold 22,664 cars, up 28 percent. American Suzuki sold 2,026 cars in September, a 23 percent rise over last year and year-to-date sales are at 20,284, a 20 percent increase. Post will be updated as manufacturers report.